NrGize is dedicated to providing you with an outstanding experience every time you visit! 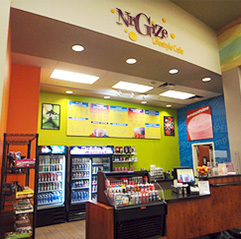 Please explore this website to find just about anything you’d like to know about NrGize Lifestyle Cafe! Please call our customer service line at 1-866-4-Kahala to speak with our dedicated customer service staff. For information on fundraising, pricing and local marketing programs, please contact your local store. Contact information for our stores may be found by using our store locator.